We’d like to hear from you. Should you have any suggestions for Catholic organisations that are not listed here, a general query, want to advertise or would like to speak about something else please completer the form below and we will contact you back. We take your privacy seriously and we will not share or sell your contact information. 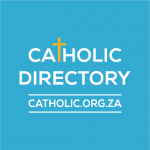 At catholic.org.za we provide a comprehensive index and listings of all Catholic organisations around South Africa.